By July of 1969, NASA had done about as much as they could to prepare for the Moon landing. On the flight of Apollo 10, Tom Stafford and Eugene Cernan had taken their LM Snoopy into the descent orbit but had gone no further before returning to John Young in the CSM Charlie Brown. Where Snoopy had feared to wander, Eagle swooped in. Although the first landing attempt, flown by Neil Armstrong and Buzz Aldrin, would be ultimately successful, it was by no means a straightforward ride. Landing on the Moon was a 12-minute rocket ride from orbit with a starting speed of nearly 5,500 kilometres per hour leading to a gentle touchdown on a terrain where no prepared ground awaited the LM. In that short time, a plethora of problems were served up that would have curled the toes of everyone involved had it been merely a simulation. The fact that they all occurred on the actual landing attempt in full view of the world, yet were successfully handled, is testament to the professionalism of the mission control team and the crew, and to the power of exhaustive simulation to properly prepare people for the challenges they may face. Planners broke the descent into three parts, each controlled by a dedicated program in the computer. 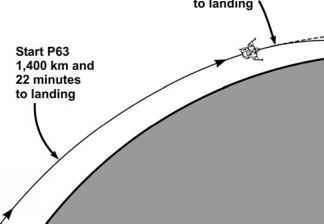 The first was the braking phase, when most of the spacecraft's orbital speed was countered by the thrust of the descent engine. This was P63's domain which began 10 minutes before the powered descent. It included the engine's ignition and lasted for the first 9 minutes or so of the nominally 12-minute burn while the computer worked to take the crew to a point in space known as high gate, typically 2,200 metres in altitude and about 7 kilometres from the landing site. Throughout the braking phase, the LM flew with its engine pointing in the direction of travel. At high gate, P64 took over. Diagram showing how Program 63 began nearly 1,000 kilometres before PDI. P64 handled the approach phase of the descent. When the program assumed control, its first action was to pitch the LM to a more or less upright attitude in order to enable the crew to see the landscape ahead, with the point at which the computer was taking them being just on the near side of the horizon. They then flew in a manner roughly similar to a helicopter, but with the LM carefully balanced on top of the engine's exhaust with the computer still in full control of where it was going. It informed the commander of where it was taking them, but if that was not suitable, then with a nudge of his controls he was able to instruct the computer to move the aim point. P64 took the LM to low gate, a point only about 100 metres above the surface and about 600 metres from the landing site. Begin P66 and terminal descent. About 30 metres and 30 seconds to landing. 500 km and 11.5 minutes to landing. When FIDO, the flight dynamics officer, had planned the DOI manoeuvre, he arranged that the resultant descent orbit should have a perilune of about 15,000 metres altitude over a point on the Moon 500 kilometres east of the landing site, this being where the descent to the surface would begin. As the LM coasted towards this point, with all the required checks completed, the flight director spoke over his communication loop to all the flight controllers in the MOCR, briefly interrogating each relevant controller as to whether, as far as his area of responsibility was concerned, he was happy for the mission to proceed to the next stage - powered descent initiation (PDI). Ten minutes prior to PDI, the commander started P63 running in the LM's computer, which handled the start of the burn and most of the subsequent descent. "Okay. Master arm's on,'' said Dave Scott with less than a minute to go to PDI. "I have two lights.'' Explosively operated valves were ready to fire and let supercritical helium enter the propellant tanks. "Standing by for ullage,'' said Irwin. "Standing by for ullage,'' repeated Scott, in the conventional challenge-and-response manner of those steeped in aviation. The thrusters that pointed in the same direction as the main engine were burned for a short period to settle the heavy propellants to the bottom of their tanks so that, on ignition, the light helium gas would be at the top of the tank, not near the plumbing that led to the engine. "Go for the Pro,'' said Scott. Then, "Pro," as he pressed the 'Proceed' button on the computer to give P63 permission to proceed with ignition and the commencement of the braking phase of the descent. "Ignition," announced Armstrong to Aldrin as Apollo ll's LM Eagle began the human species' first descent to another world. On all the missions, at PDI the DPS engine was initially run at only 10 per cent thrust for 26 seconds to give the computer enough time to sense whether the engine's thrust was acting through the LM's centre-of-gravity, and if it was not, to move its supporting gimbals until it was. This ability to vector the thrust was not intended to steer the craft. It was too slow for that. Steering was provided by the RCS thrusters, leaving the engine's gimbals to deal with longer-term centre-of-gravity shifts. Aldrin counted up to the end of the low-thrust phase. "24, 25, 26. Throttle up. Looks good!" Propellants poured into the engine as it went to its high-thrust setting. Starting with Apollo l2, engineers added a modification to the computer's programming to achieve pinpoint landings. Over the first minute or two of the powered descent, the progress of the LM was tracked from Earth. From this, engineers could measure the difference between where they wanted to land and where the computer was actually taking them. "Roger. Copy. Plus 04200,'' confirmed Bean. This was the important call that ensured that the LM would land where it was supposed to, and it was extremely dangerous. Noun 69 held three values that represented an update to the position of the landing site in three dimensions. The value, +4,200 feet (1,280 metres), shifted the computer's idea of where they should land further downrange, fooling it into taking them where they wanted to go. When the crew had punched the number into the DSKY, mission control took a look at the telemetry to verify they had done so correctly before confirming that they could 'enter' it into memory. Had the crew inadvertently entered the data wrongly, they could easily have sent the LM out of control and been obliged to abort. ''Intrepid, Houston. Go for enter,'' said Carr once he had received word from other flight controllers that the crew had typed the update into the correct field. ''Intrepid, Houston. Looking good at two,'' replied Carr as they passed the 2-minute mark into the burn. Throughout P63's regime, the DPS engine had to fire more or less into the direction of travel. However, as long as it did so, the LM could make rotational manoeuvres around the engine's axis. 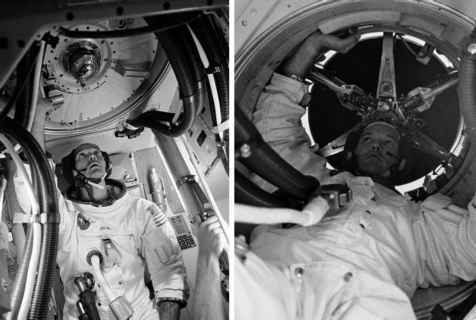 On Apollo 11, the first few minutes of powered descent were flown with the windows, and therefore the crew, facing towards the surface. Armstrong had used the angle markings on his window to time the passing of landmarks below. Before ignition, he had used this as a check of what their perilune altitude was going to be. This used the fact that the closer you orbit a body, the faster the landscape below appears to pass by. After ignition at PDI, he could compare the absolute time a landmark passed with a predicted time. Since they were travelling at about 1.5 kilometres a second, only a few seconds early or late signalled the extent of any miss. It was a simple but powerful technique. "Okay, we went by the 3-minute point early,'' said Armstrong. "We're long.'' He was right because they landed 6 kilometres further down-range from where they planned. 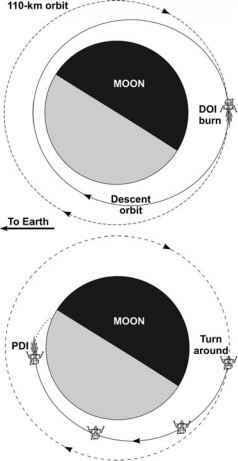 Diagram showing Apollo 12's manoeuvres between DOI and PDI. an excellent look at the Moon going around."